So tomorrow I am driving from Oklahoma to Albuquerque, New Mexico. Mostly along historical Route 66. Except it's not called that anymore. I have driven this road enough times that I can describe the entire trip. I leave early. About three miles south, I stop for a very large cup of Starbucks. This is to get me to the freeway (nee Route 66). I go south on 81 and have to slow down in Waukomis, Hennessey, Dover, Kingfisher and Okarche. Then I have to take a weird route through El Reno past the minimum security prison. I then emerge, like a river unto the sea, onto I-40, where I will spend quite a few hours navigating the waves. My first goal is to get to Texas. Not because I am crazy about Texas, but because it means I'm one state closer. It also means I get to start reading signs for The Big Texan Steak Ranch. If you eat this 72 ounce steak, a salad, shrimp cocktail, and a baked potato, you get your meal for free. Then you have a heart attack and your insurance goes up. It's a wash. My next "okay I'm this far" (while still keeping track of the steak ranch signs) is the largest cross in the western hemisphere. It's really very cool and you can see it for miles. When I traveled with the kids when they were younger, we always stopped here and walked around. When I'm alone, I tend to just put the pedal to the metal until I get there. 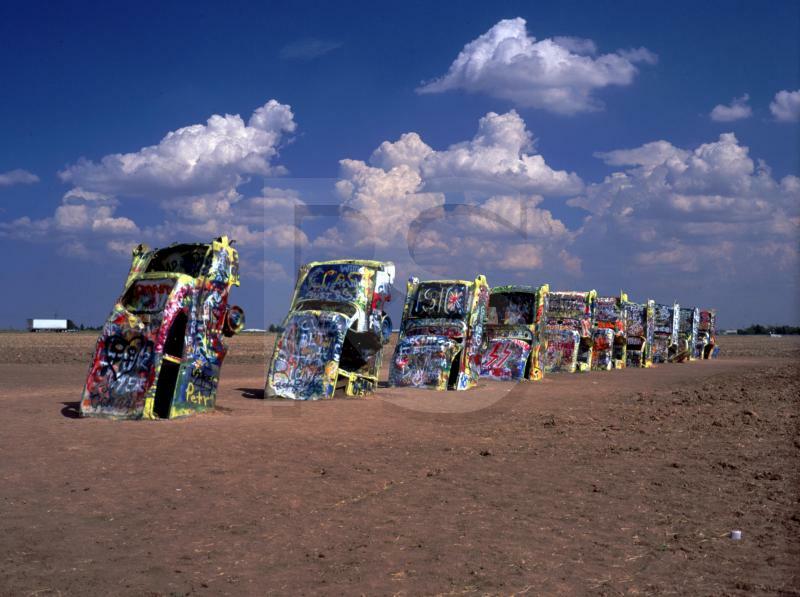 After that, a drive through Amarillo by Morning, a wave to the Big Texan, and a wave to the Cadillac Ranch on the other side. Then, I am in freeway hell for a couple hundred miles. Can't get a good radio signal, the wind is blowing 76.8 mph, you get into New Mexico with the awesome mesas and the huge blue sky, but you can't enjoy it because you have to deal with 1.3 million semis. Hopefully, you are lucky enough to not be traveling during tornado season (not), and you won't hit Santa Rosa at sunset because then you can't freaking see for at least a half hour. Then there is Albuquerque itself and I have never driven in ABQ without getting lost. Sometimes just a little, but mostly big time. I did get onto Google maps and hopefully can find the way to my mother's heart hospital. Otherwise, I'll have to call my brother's cell, tell him where I am, and he can find me curled in the fetal position in the back of my van. Saturday, I get to do it all in reverse, but I am always driven by the call of my own bed, so it's not as traumatic. If anyone wants a 72 oz. steak, let me know, I can pick one up on the way home. P.S. If I don't get to blog while I am there, I'll see you all on Saturday! Have a safe trip!! I cannot imagine taking a road trip like that by myself, but then anyone that knows me, knows I don't do anything by myself.....LOL I hope your Mom is doing okay. I will be thinking about you while you are gone!! di- I think you do a lot by yourself for which you don't give yourself credit. I thank you for your prayers and please keep me in them tomorrow - that one stretch of road is brutal! Have a safe trip, and you, your mom, and the rest of your family are in my prayers! And she'll take off time just to give me a call. Sorry, you put that stupid song in my head so I thought I'd give it back. tracy - Thanks, got here safely, going back Saturday. Mom's doing great. They put her into a rehab hospital with great people. I know the prayers are working! h-man - Hey, that's a good song. BTW, The Partridge Family (remember I was going to marry Keith) had a song about Albuquerque and Tim McGraw did a song about a bunch of places and ABQ was one of them. Check it out, get another song in your head all day long. My mother was a Fred Harvey girl in Albuquerque back when the railroads were king. Does that make me one of the big dogs? bill - I had to Google Fred Harvey girl. That's cool, your mom helped settle the west!